Delivery bicycles with pedals and a battery pack that helps them pick up speed are regularly seen zipping up and down New York City's avenues at dining times despite the fact the so-called electronic bicycles -- or e-bikes -- are illegal. New York City Council Member James Vacca (D-Bronx) has been concerned for some time that e-bikes are a public safety hazard. Two years ago, when he was chairman of the city council’s transportation committee, he passed a bill to toughen penalties for riding e-bikes. Since then, Vacca has been disappointed by how that law is enforced -- especially given Mayor de Blasio's Vision Zero push to eliminate deaths and injuries on city roads. "We cannot have Vision Zero in New York City be totally successful without addressing the e-bike problem that we have," Vacca said. " It's a serious one." According to the NYPD, officers have issued 685 summonses for e-bike and scooter violations since July. Before this summer, the NYPD did not keep statistics on e-bike violations. Vacca says that’s not enough. Under state law, bikes that have motors but cannot be registered with the Department of Motor Vehicles are banned from public streets. The city’s administrative code also makes it illegal for individuals and businesses to use e-bikes. Maureen Dougherty said she found out about the dangers of e-bikes the hard way. Two years ago, she was cycling home when an e-bike going the wrong way down a one-way street blind-sided her. “I really thought I might have been impaled,” Dougherty said. “You are really playing Russian roulette when you ride your bike home during the dining hours." The I-Team staked out some busy streets during the lunch hour in Manhattan and found e-bikes going the wrong way on one-way streets. The I-Team saw them riding on sidewalks too. Attorney Dan Flanzig represents bike riders involved in all kinds of accidents and disputes. He says e-bike enforcement is haphazard because even police may be confused as to what kinds of motorized bikes are outlawed. "I'm an attorney who represents cyclists and I have a hard time telling you what is an e-bike and when it can be used," Flanzig said. "A police officer doesn't have the training or ability to know and define an e-bike and identify an e-bike and issue a summons when it's being used improperly." Flanzig said he supports legislation now pending in the state Senate that would define e-bikes and set rules for them, including that riders need to be at least 16 and must wear helmets. Once the law is clear, he says, it can be better enforced. An NYPD spokeswoman told the I-Team that as of last summer, "The NYPD has established a Patrol Guide procedure to increase public safety by enforcing laws pertaining to the use of motorized scooters and electric bicycles." 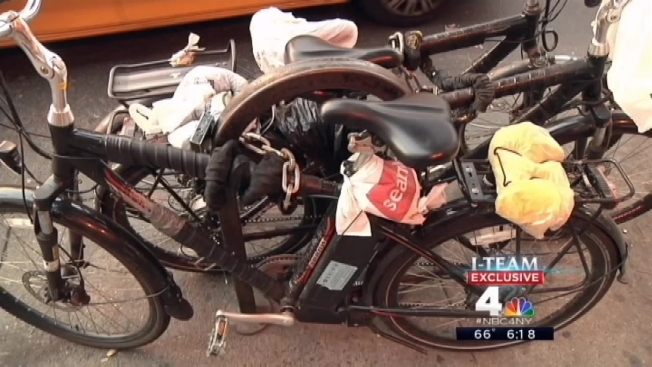 Last week, the 19th Precinct tweeted a photo of a pair of e-bikes confiscated. Dougherty would like to see more of this, because confiscating bikes hits restaurants where it hurts -- in the pocket. "I just think restaurants have to be more accountable," she said.